At Syntelli Solutions, we love hearing and celebrating the success of our customers. We strongly believe in the power of data analytics and the important benefits it brings to an organization. In a recent article on IDG Connect, Rob Canton, CFO and head of data analytics for the Tampa Bay Lightning, explains that his staff relies on sports analytics to ensure that fans get the most of their experience at games. Specifically, Canton and his team use TIBCO™ Spotfire®, a business intelligence tool, which helps data analysts get actionable insights about the team’s mentions on social media, CRM, ticket sales, and point-of-sale income. 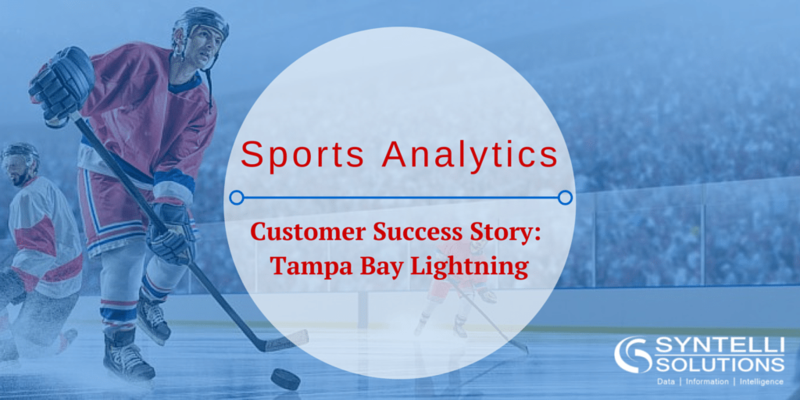 Syntelli was honored to be the preferred partner that helped implement Spotfire for Tampa Bay Lightning and developed reports that enabled the team to take its sports innovation and interaction to the next level. Today, Canton’s staff creates instantly customized reports and tailors offers to the level of individual fans. And data analytics helps Canton and his staff predict and further enhance fan engagement in the arena. When Canton says that sports teams need to take advantage of new technologies to continue engaging loyal fans and attracting new followers, the data scientists at Syntelli couldn’t agree more. They look forward to helping other organizations such as the Tampa Bay Lightning, make the most of their data and fan loyalty. To see how Syntelli Solutions can help your team make the most of your data, contact us to request a demo or call us directly at 1-877-SYNTELLI.